Www.masoncountybirding.blogspot.com includes details on a big year I had in Mason County in 2015. The George Adams National Fish Hatchery (see bottom left of this map and citation in the text) is now the George Adams State Salmon Hatchery. Faye Hands and John Riegsecker of the ABC Club of Tahoma Audubon lead regular walks at the Theler wetlands. They are great! Hood Canal—a beautiful, sheltered arm of Puget Sound—is one of only a few true fjords in the conterminous United States. Its deep waters, steep sides, and narrow, rocky shoreline support comparatively smaller numbers of wintering waterbirds than the rest of the Sound. Birding is primarily from along the edge of US-101, which clings to the west rim of Hood Canal. There are few places to get out and walk, and the shoreline is either not accommodating to foot travel or is privately owned. However, birding can be quite productive at the modest deltas, salt marshes, and shallow waters at the mouths of the principal rivers (from east to west, then south to north, Union, Skokomish, Hamma Hamma, Duckabush, Dosewallips, and Big and Little Quilcene) and a few smaller creeks. Such estuarine habitats draw waterfowl and gulls, and most have salmon runs that attract birds in season (usually October–November). Numerous forest roads and wilderness trails reach into the eastern Olympics from US-101. Birders may wish to sample lower-elevation forest habitats on an easy drive up 2,800-foot Mount Walker, or hike through upperelevation forest zones to alpine parkland at the 6,200-foot summit of Mount Townsend. From the intersection with SR-8 west of Mud Bay (page 206), proceed north on US-101 21.3 miles to the Purdy Cutoff Road north of Shelton. Turn right here, opposite the George Adams National Fish Hatchery (a spot for American Dipper), and descend the lower Skokomish River Valley to the junction with SR-106 (2.8 miles). Turn right toward Union. After another two miles you will reach the south end of Hood Canal and the mouth of the river at Annas Bay. There is one small pullout on the left. This area offers extensive excellent saltwater habitat and high concentrations of birds, especially in winter. Bald Eagles are numerous at all times, especially when the salmon are running in early winter. The main drawback is access. Much of the lower Skokomish River lies within the Skokomish Indian Reservation or is in private ownership. Generally, birding—though productive—will be from the edge of the road and a long-distance affair. Find a wide spot along the shoulder and scan the salt water, shoreline, and delta. Common wintering waterfowl include Mallard, Northern Pintail, Red-breasted Merganser, and large flocks of American Wigeons. Farther out in the bay Canvasback (uncommon) and Common Goldeneye are found along with flocks of Surf, White-winged, and Black Scoters (uncommon to rare). This is a favorite area for loons and grebes. Yellow-billed Loon has been seen here, and Clark’s Grebe has been found among the Westerns. Continue 1.7 miles to Union, where Hood Canal makes its Great Bend to the east. Pull out on the left, across from Union Country Store, and scan the open salt water. This is a good spot for birds that prefer deeper, more open waters than those of Annas Bay. In August, Purple Martins may be seen on pilings or boats at the small marina. 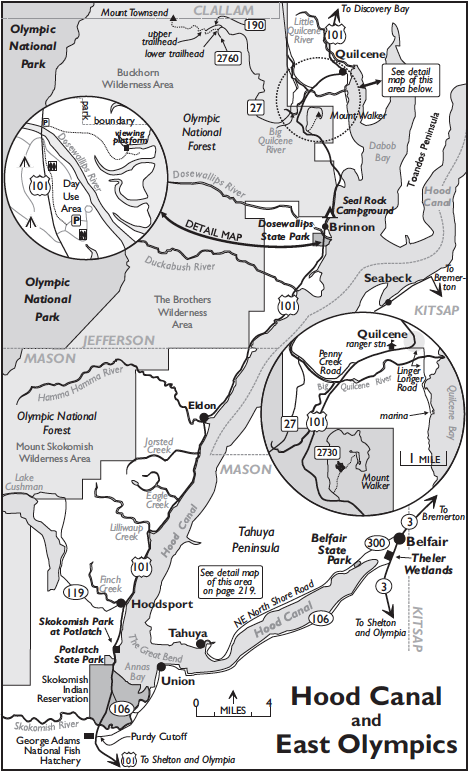 Turn around and retrace SR-106 west to US-101 (5.2 miles from the Union Country Store), and turn right (north) to Potlatch State Park (1.9 miles) at the northwest corner of Annas Bay (Discover Pass required). The waters here are quite productive from fall into spring. Horned, Red-necked, and Western Grebes are common, as are Red-throated and Common Loons. Scaups, scoters, and goldeneyes also winter here in good numbers. A half-mile north of the state park on US-101 is Skokomish Park at Potlatch (formerly Tacoma Power’s Saltwater Park). A large parking lot with boat ramp is on the right, across from the powerhouse. The penstocks and power canal discharge a large volume of cold, fresh water that has been diverted from the North Fork Skokomish River and the Lake Cushman hydroelectric project. Conditions here attract a variety of waterbirds, including Harlequin Duck (occasional) and Barrow’s Goldeneye. The fish hatchery on Finch Creek, on the right at the north end of the town of Hoodsport (2.8 miles), is also good for waterbirds. Park at the hatchery (portable toilet available) and walk through the complex to the creek mouth. Continuing north on US-101, you will pass over bridges at the mouths of Lilliwaup Creek (4.3 miles with a WDFW pullout 0.5 mile past bridge), Eagle Creek (2.5 miles), and Jorsted Creek (3.2 miles), which can have concentrations of waterbirds in fall and winter. There is a small pullout just past the Eagle Creek bridge on the right. All three cormorants (Brandt’s uncommon) roost on the pilings of the former log dump and decking area just north of Jorsted Creek, and Purple Martins sometimes use them in late August and early September. The Hamma Hamma River (1.5 miles) is a large stream with an estuary and salt marsh. There is one pullout 0.25 mile past the bridge. Brant, bay ducks, gulls, and sometimes shorebirds may be seen from a spot on the south side of the Hamma Hamma Oyster Company at the south end of the estuary. When salmon are running (October–November), look for Bald Eagles in the trees just upstream of the bridge on the far side of the estuary. There is a Great Blue Heron rookery nearby. The Duckabush River estuary (9.9 miles) was once known for its small wintering population of Trumpeter Swans, but they have been absent in recent years. Pullouts are narrow and the traffic unforgiving, so be careful. Dosewallips State Park (3.1 miles), at the mouth of the Dosewallips River just south of Brinnon, offers some of the best and most accessible birding on Hood Canal (Discover Pass required). Diverse habitats include conifer forest in and around the campground, a Red Alder-dominated riparian zone along the river, and thickets, openings, and salt marsh leading to the open shoreline and sloughs at the river’s mouth. Turn right off the highway into the day-use area (restrooms), or left to the campground. For the best birding, drive 0.4 mile north across the river on the highway bridge to the beach-trail parking lot on the right just past the bridge (not well signed), and walk to the beach through mixed riparian vegetation beneath some large cottonwoods. Vireos, chickadees, kinglets, and warblers may be here in good numbers during migration; Hutton’s Vireo and Townsend’s Warbler are usually somewhere in the vicinity during fall or winter. The area around the viewing platform can be good for sparrows, with Savannah, Song, Lincoln’s, White-crowned, and Golden-crowned Sparrows present seasonally. From the platform itself, the shoreline, salt marsh, and open-water habitats beyond can be scanned (best at high tide). Harbor Seals haul out at the river mouth, and gulls can be abundant. If you walk across the bridge, scan upstream and down. Harlequin Duck (rare), Common Merganser, and American Dipper have all been seen here. Around the end of September you may be treated to the sight of spawning salmon. Seal Rock Campground (1.2 miles), just off US-101, has many of the same birds and is also a delightful place to camp, although it closes for the winter in September. Quilcene Bay is a rich winter area for waterbirds. From the Olympic National Forest Hood Canal Ranger District office at the south edge of the town of Quilcene (10.2 miles; maps, road and trail information), continue 0.3 mile to a fork where US-101 northbound bends left. Go straight ahead (east) onto Linger Longer Road. The road soon turns right. About 1.1 miles from US-101, turn left into Indian George Creek access. There is poor signage here, but look for a sign at the far end of the parking area for Quilcene Bay State Tidelands (Discover Pass required), then drive out to the shore of the bay. Return to Linger Longer Road and turn left, continuing 0.6 mile to where the road dead-ends at the Herb Beck Marina. This is a good place to scope the bay and shoreline at any tide stage. There are picnic tables and toilets when the port office is open. The short trip up Mount Walker is an excellent way to see birds of the conifer forest. Head northbound from Seal Rock Campground on US-101 for 5.6 miles, turn right onto FR-2730 at the sign for the Mount Walker View Point. (Southbound from Quilcene, this turnoff is on the left 4.6 miles from the ranger station.) The four-mile road is suitable for passenger vehicles, but not recommended for trailers. It is gated from October through March, a time when bird activity is at a lull. Both Townsend’s and Hermit Warblers are found here (and a range of intergrades between the two). The steep side slopes allow for views into the canopy, which greatly simplifies finding these and other frequently-encountered species such as Hammond’s and Pacific-slope Flycatchers, Gray and Steller’s Jays, Chestnut-backed Chickadee, Brown Creeper, Pacific Wren, Golden-crowned Kinglet, and Varied Thrush. Watch for Sooty Grouse crossing the road with young in the late summer. Northern Goshawk and Northern Pygmy-Owl are sometimes seen. Birds can be found anywhere from the Mount Walker trailhead, a quarter-mile from the highway, to the summit (elevation 2,804 feet) with spectacular views of Puget Sound, Mount Rainier, and Seattle to the east, and the Olympic Mountains to the west. Those who crave exercise may park at the trailhead and walk the two-mile trail to the top (roughly 2,000 feet elevation gain). The trail climbs steeply through hundred-year-old Douglas-fir forest with Pacific Rhododendron, Salal, and Cascade Oregon-grape understory. If you enjoy hiking, consider an outing to Mount Townsend, about 15 miles north and west of Quilcene. From US-101, turn west (right) onto Penny Creek Road (0.9 mile south from the ranger station in Quilcene). After 1.4 miles, turn left onto FR-27 (Big Quilcene River Road) and continue 12.4 miles to FR-2760, then left another 0.7 mile to the lower trailhead. Park here at a wide spot in the road (America the Beautiful or Northwest Forest Pass required). To save a mile of hiking each way and 500 feet of elevation gain (but also skipping deep woods and views of Sink Lake), do not turn off at the lower trailhead but instead continue up FR-27 for another 1.2 miles, then go left on FR-190 to the upper trailhead (0.7 mile). The moderately difficult but well-maintained Trail 839 climbs 3,350 feet over 5.5 miles to the Alpine/Parkland vegetation zone, traversing the Olympic Douglas-fir and Subalpine Fir zones on the way. The 6,200-foot broadly rounded summit—densely carpeted with Common Juniper, Shrubby Cinquefoil, and boreal lichens—is in the Buckhorn Wilderness Area. Snowfall is relatively light on the dry northeast side of the Olympics, so the trail is usually snow-free by June. The summer wildflower show can be fantastic. Birding possibilities are similar to those for Deer Park (page 40), but without the cars and people. Look for Sooty Grouse in the open subalpine forest and Townsend’s and Hermit Warblers near the trailhead. On SR-3 in Belfair, 0.5 mile north of the junction with SR-106, is Theler Wetlands, the estuary complex at the mouth of the Union River. Turn left off of SR-3 into the Mary E. Theler Community Center and park south of the building where you will see the entrance to the wetlands. There are a number of examples of bird-related public art to be seen, as well as a native plant area with labels. A pit toilet is at the parking lot and another at the farthest end of the trails. About two miles (3.8 out and back) of trails access riparian areas, an alder/cedar swamp, salt marsh, and tidelands. Trails are level and wheelchair friendly. Rock Wall Trail, Alder/Cedar Swamp Trail, and South Tidal Marsh Trails are short with easy return to the parking lot. River Estuary Trail is the longest and most diverse. In 2013 the dikes along the River Estuary Trail were breached in two locations to restore 29 acres of pasture to salt marsh. If one includes the adjacent Pacific Salmon Center/WDFW lands, there are 135 acres of area protected from development. A good variety of habitats are found here, home to over 200 species of plants and many species of insects; as many as 176 species of birds have been seen here including a number of rarities. Rock Wall Trail is good for warblers and flycatchers in the spring and summer, as well as year-round Barred Owl. Alder/Cedar Swamp trail has mixed riparian forest and has had Red-breasted Sapsucker, Downy, Hairy and Pileated Woodpeckers, Hutton’s Vireo, Pacific Wren, and Cedar Waxwing in any season. In spring and summer, look for Orange-crowned, Black-throated Gray, and Wilson’s Warblers, and Western Tanager. This trail can be closed in the winter due to slippery boardwalks. South Tidal Marsh Trail is an elevated trail that leads nearly to the tideflats. The marsh and alder thicket can be good for Willow Flycatcher, Warbling Vireo, Marsh Wren, and Yellow Warbler. Waterfowl, a variety of gulls, and a few Caspian Terns can be seen along the shoreline. In spring, the rails of the boardwalk are lined with Tree, Violet-green, and Barn Swallows. Watch for Anna’s and Rufous Hummingbirds and Great Blue Herons anywhere. River Estuary Trail has ponds and sloughs where River Otters are frequently seen; Virginia Rails and Belted Kingfishers nest here. This trail is partly on dikes that have been breached to allow the marsh to return to historical estuary for salmon and wildlife enhancement. The restored tidal marsh hosts a good variety of waterfowl including Northern Pintail, Green-winged Teal, and Common Merganser, as well as Black-bellied and Semipalmated Plovers, Killdeer, Dunlin, and Spotted, Sharp-tailed, Least, Pectoral, and Western Sandpipers, dowitchers, Wilson’s Snipe, and Bonaparte’s Gull. The crabapple trees, blackberry bushes, and other shrubs have Cedar Waxwings, House and Purple Finches, Red Crossbills, and a good variety of winter sparrows. American Pipit (migration), Savannah Sparrow, and American Goldfinch are in former pastures near the Salmon Center, which are also good for Greater White-fronted, Cackling, and Canada Geese. Raptors have included Bald Eagle (reliable), Northern Harrier, Cooper’s and Red-tailed Hawks, American Kestrel, Merlin, and Peregrine Falcon. Northern Shrikes are seen in winter. Turn left out of the Theler parking lot onto northbound SR-3, go 1.1 miles, and turn left onto SR-300 (aka NE Clifton Lane). It’s 3.1 miles to Belfair State Park, on the left. Good restrooms are available here. A Discover Pass is required, and rangers are often there to sell them. After the gate, turn left and curve toward the water on the southeast, which is the outlet of Mission Creek into Hood Canal. This is a good marine bird spot and sometimes hosts rarities such as Eared Grebe, Willet, and Semipalmated Sandpiper. The campground is in the southwest beach area at the outlet of Little Mission Creek, which trails through the campground to the beach and has most woodland species in appropriate seasons as well as Mountain Quail historically. To find Mountain Quail, familiarize yourself with their calls and try to do this route in March through May. At other seasons, playback of calls may be helpful. Turn left out of Belfair State Park onto SR-300 and head west. Continue on SR-300 as it becomes North Shore Road. In 7.8 miles at the 11000 block, turn right onto Canyon Drive into Belfair View Estates and continue upwards on this winding road. In 0.5 mile at the top of the hill, Canyon Drive becomes Hurd Road. Continue on Hurd Road, stopping at several intersections with dead-end roads where the roadway widens next to open scrubby areas. Listen for Mountain Quail. Hurd Road changes to gravel at Belfair View Road. Continue another 0.5 mile north on Hurd Road to a pullout on the right by a yellow gate, the unsigned entrance to state forest land. You may enter on foot. This is the best spot for Mountain Quail and also provides great views of the Olympic Mountains on the left (west) side of the road. Listen as well for Hermit and Townsend’s Warblers in springtime. Backtrack down Hurd Road to the intersection with North Shore Road (SR-300), then turn right. In 3.1 miles, cross the Tahuya River Bridge, then in 0.1 mile turn right onto NE Belfair-Tahuya Road. In 0.4 mile, veer left to stay on Belfair-Tahuya Road. Proceed 4.8 miles to NE Tahuya-Blacksmith Road. Turn left here and begin looking and listening for Mountain Quail.